"Ongoing Problems After Knee Injury"
Thank you for your time. i hurt my knee a year and a half ago training. I have been doing exercises for my injured knee for 3 months, but am not seeing much improvement. I saw my doctor almost 1 month ago to get some more help. He evaluated my knee and had me move it in several directions. He noticed when I extended it out in front there was what he called a "crunch". He said to straighten and flex my leg at the same time 5 times a day and gave me an anti-inflammatory prescription.He also said to avoid lunges. Hi Ryan. I'm sorry to hear you've been having problems for so long - how frustrating. Have you seen a physical therapist? If not, I would recommend that you do. They will be able to evaluate the different structures in and around the knee and identify any areas of weakness and tightness that may be causing the problem. 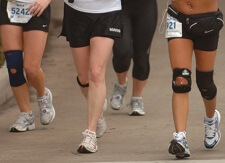 Accurate knee pain diagnosis is key to working out the right rehab plan. Have you been doing any other exercises, or just the one your doctor gave you? If it's just been the one, I suggest adding in some knee strengthening exercises. Aim to do 3-4 exercises, targeting different muscles (quads, hamstrings and glutes) and do them twice a day. As you get stronger, you'll be able to progress on to more challenging exercises.